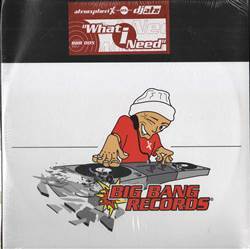 BREAKS, Big Bang, USA, 2000... Acid, Progressive House with What I Need (AtmoshperiX's Progressive Mix), What I Need (DJ ATX's Acid Mix). DRs Of Funk - Maximum Perversion 10" Pro-Ject X - The Summit 12" Cortex - Just One More Time / Adrenalin 12" Mpress - Time Out (Remixes) 12"
Kings Of The Wild Frontier - Mexico 12" Simon Harris - Bass (How Low Can You Go) 12" Producenterna - Beatz, Flows & Hoez 12" Farmer - Get Out Of That Field EP 12"